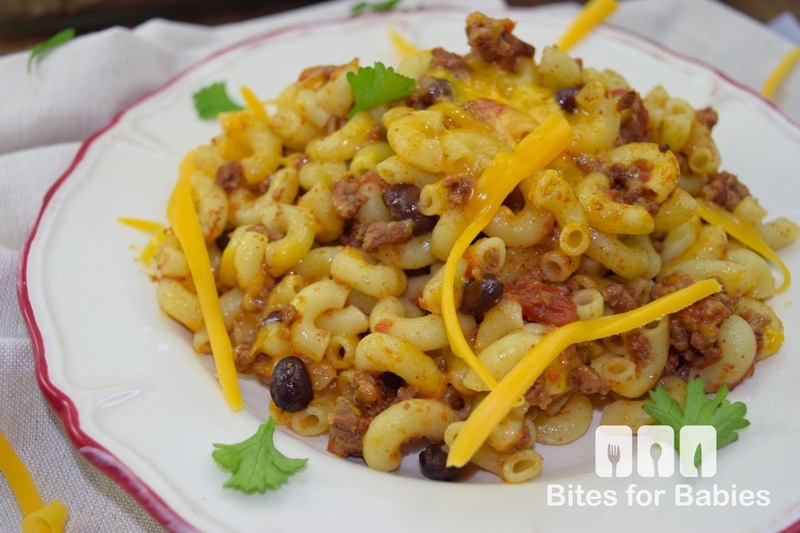 Two comfort food favorites—pasta and chili con carne—come together in this delicious chili pasta casserole, which combines the traditional elements of chili-ground beef, earthy spices, and chunky tomatoes and perfectly cooked al dente pasta, all smothered with creamy cheddar cheese. Casseroles are life-savers when it comes to providing the family with homemade meals, especially on busy weeknights. More often than not, when busy parents find themselves pressed for time in the evenings they opt for a quick dinner option for the family, which usually means take-out, and coincidentally equates to unhealthy. 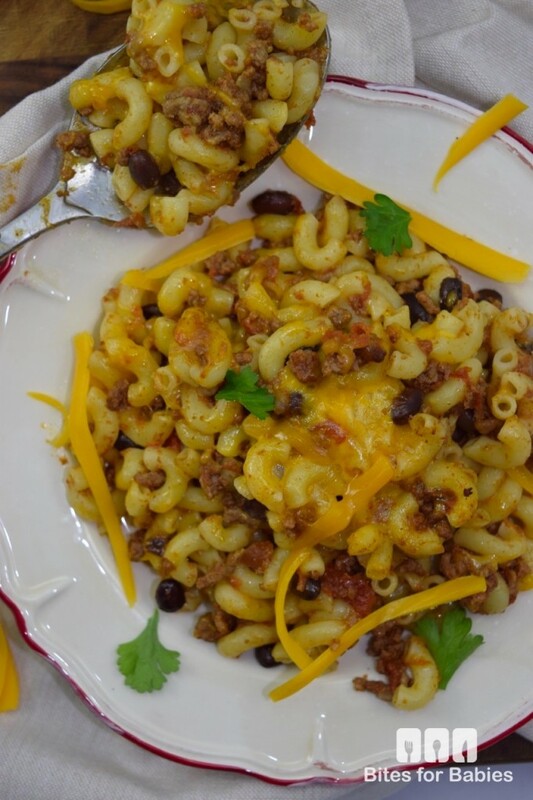 With this chili pasta casserole you can rest assured that dinner will be stress-free and no- fuss. Prepare large batches of this freezer-friendly meal in advance (for example, on the weekends when you have more time available to you) then simply remove from the freezer and warm up in the oven. For this recipe I’ve used previously prepared chili con carne (conveniently frozen in batches), which makes the preparation for this meal even simpler. 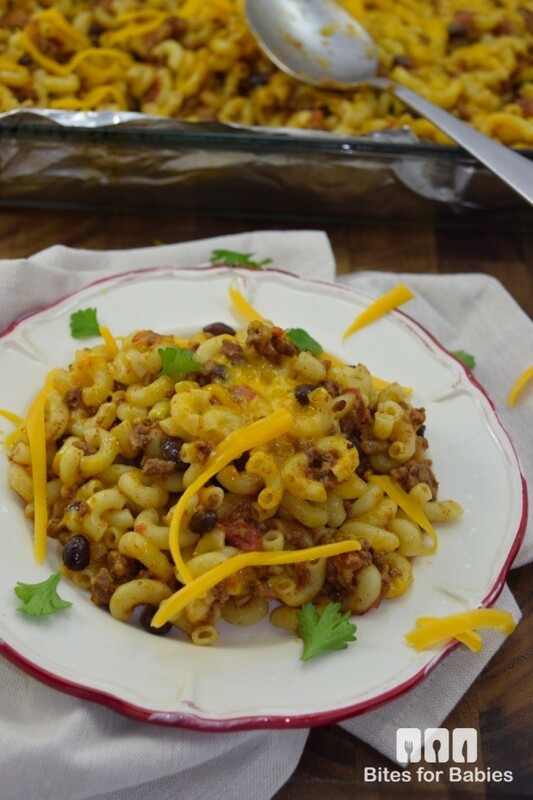 Simply defrost the chili, cook the pasta, then mix it all together in a casserole dish, top with shredded cheddar cheese and bake until bubbly. Serve this chili pasta casserole with fresh scallions and a dollop of plain Greek yogurt or sour cream. Set the oven to 400 degrees. In a large pot bring water to a boil. Add the pasta and cook for 1-2 minutes less than the suggested cooking time on the package. Once cooked, drain and return to the pot. Add the chili and mix with a large spoon until combined. Line a large baking dish with aluminum foil then transfer half of the pasta to the baking dish. Layer with half of the grated cheddar cheese. Layer the remaining pasta into the baking dish then top with the remaining cheese. Bake, covered with aluminum foil for 15-20 minutes or until the cheese is melted and the chili is heated through. Turn off the heat and set the oven to broil on high heat. Transfer the baking dish to the top rack and cook for 2-3 minutes or until the cheese is bubbly and crispy. Store leftovers in the fridge in an air tight container for 2-3 days or in the freezer for up to 3 months. I make a recipe similar to this and it’s really tasty! Your recipe sounds yummy too! This is a really great combo of two of my favorite meals! I bet this is super delicious! This is a nice twist on having chili or pasta for dinner. This looks like something that my brother and nephew would like to eat. I am obsessed with pasta lately and this one look super yummy!! If you love chili you will love this recipe! I reinvent leftovers all the time…most of my meals are reinvented ones! What a great way to extend chili. I always want to try to make it more of a meal and this is a great way ot do that. It is, plus I always make a huge batch of chili. Sometimes it’s nice to switch it up a bit! I can’t wait to try this recipe! Love anything Hispanic with a twist! Omg this looks so yummy!!!! I just love anything chili flavor!!! I will have to give this a try! I’ve also made this with chicken chili and vegan chili…they’re just as delicious! I love this! My son would be gobbling this up in no time. This looks amazing! I love all kinds of pastas like these. I’ll have to make this one for my family soon. I’m sure we’d love it! It’s a great family meal and freezes really well. This casserole recipe looks so delicious and easy to make. I will have to get the ingredients so i can make it this weekend. My kids are going to love it. All you really need is pre-cooked chili, some pasta, and cheese! Next time I’m going to add mozzarella since my son prefers it to cheddar. This is one of those recipes that makes a cold day warm, fills you with childhood nostalgia and hits the spot! We make a slightly similar recipe in our family and it is a hit! Thanks for sharing! You always have the most brilliant ideas when it comes to creating recipes. We love chili and we love pasta, but I surely never thought of this. Yum! Thanks so much Lynn…it’s very flattering to hear! Once before when I was making chili, I just threw some elbow mac in with the rest of it not sure what would come out, but my hubby LOVED it and said I had to fix it that way more often. It is amazing how the added pasta can really bump up the flavor of a dish. Oh my, that looks really good! Now, I know what to do with leftover chili. Thanks for sharing this. Thanks for giving me an idea of how to recycle left over chili! This would be a new family favorite! My mom always adds noodles to her chili. Always has, and I know that is so weird to some people. I don’t now because my husband doesn’t eat carbs. However, when I am back home, I have to have my moms. The photos are just mouth-watering! I would love to have a taste of this. Thanks for sharing the recipe. That looks delicious! I can’t wait to try and make this! YUM!! This looks just like something my mom used to make when I was little. What great comfort food! It is a great comfort food…so hearty and healthy since it’s all homemade! I love easy but delicious comfort food! I love the idea of freezing the homemade chili to make this a faster recipe, too. Looks so good! I always make large batches of chili so I always set aside enough to make this! This looks AMAZING!! I can’t wait to try this! My family would absolutely love this! OMG yummy!! We love chili in our house and I love that you found a way to make it into a casserole! Great! I hope you try this one! That looks and sounds like a yummy recipe! I’ll have to try it sometime! How delicious! I love the casseroles. This chili pasta would make a nice change for family dinner. Pasta casseroles are perfect for a busy night. Thanks for the great recipe. omg this is making me soooo hungry!!!! Can I have some please? LOL I will def be making this asap! Oh goodness! This looks DELISH! I’ve been craving chili lately, so this recipe is perfect timing! This is probably one of my favorites of your recipes so far. This looks really good! Thanks Bonnie! I hope you try this one! This looks quick and simple and an easy fix after a busy day! Plus, it’s got the kiddos favorite ingredients-cheese and pasta! Thanks for sharing this yumminess with us! And what child doesn’t like cheese and pasta, right?! This looks so good. I’m going to have to make this for my family. This chili pasta casserole looks so delicious. I need to start making more casseroles. My kids are going to love this. Yum, that looks really good! 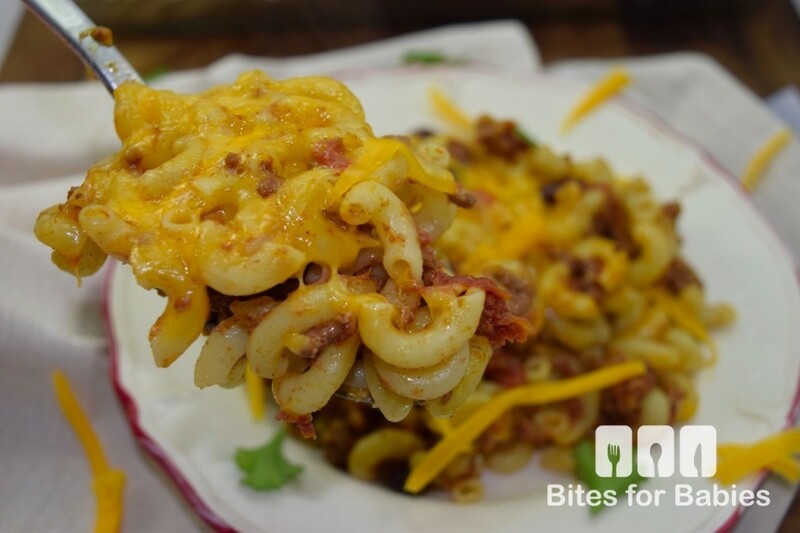 It’s such a great idea, kind of like chili cheese fries but with pasta. That looks so tasty. I’m a huge fan or casserole. I can make something delicious, and I don’t have to spend all day on it. If you have prepared chili, it’s actually so easy to make! Just prepare the pasta then throw in the oven!